Nope, not even a little bit. Lou is a very rare breed among professional sports GMs. He doesn’t give a lick what anyone thinks of him, except the people he cares about – the New Jersey Devils. His timing on MacLean’s dismissal is horrific. He never even gave the guy a chance to get the job done. But Lou always does one thing – what he thinks is best for the Devils – and that’s why Jacques Lemaire is back behind the bench. A quick look at the Devils’ 1987-88 Media Guide (with a child’s crayon drawing on the cover – not kidding), shows that Lamoriello became New Jersey’s GM just days before that season began. He was fresh off five years as the athletic director at Providence College in Rhode Island. When Lamoriello took over the Devils, John MacLean was his team’s highest-scoring forward. That’s how long he’s known the guy. During his time with the Devils, Lou has made 17 coaching changes. Clearly, he thinks a fresh face in the room, and behind the bench, is an excellent motivator for his club. A lot of times, though, that fresh face is an old, familiar face. 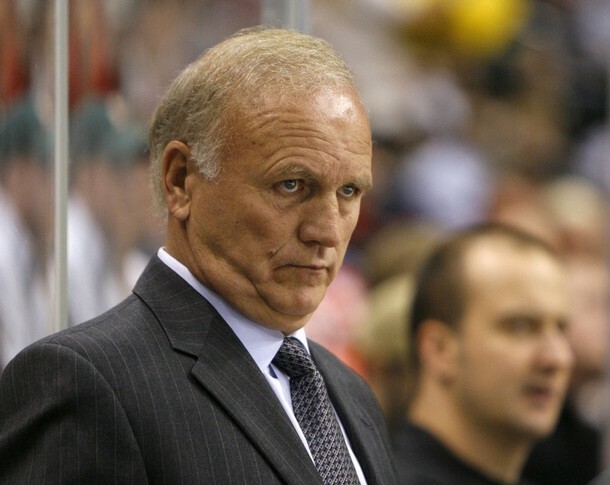 Larry Robinson, Jacques Lemaire and Lamoriello himself have had multiple stints as New Jersey’s head coach, interim or otherwise. 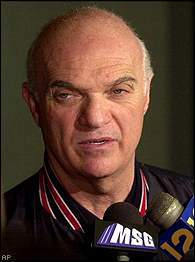 Lamoriello’s coaching-change zaniness began in earnest on March 23, 2000. 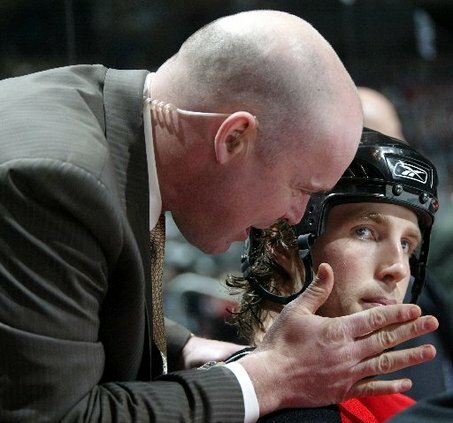 His Devils were cruising along at 41-25-8, with 95 points, when Lou piped volatile coach Robbie Ftorek replacing him with Larry Robinson. There were only eight games left in the season. The Devils won four of those (losing four) and then, incredibly, Robinson led the club to the 2000 Stanley Cup. Made Lou look like a genius. What I don’t like about the MacLean firing is that the guy never had a chance. Lamoriello stuffed a grossly overpaid Ilya Kovalchuk in MacLean’s face and said, “Here, deal with this clown.” That is an extremely tough spot in which to put a rookie NHL head coach. Guess we’ll see how Jacques Lemaire deals with lazy Ilya. I’m bettin’ Kovy might not like it much. Martin Brodeur is not only over the hill, he can’t even see the hill in his rear-view mirror. But, by making the move now, rather than waiting until, say, the end of January, Lou has given his Devils yet another chance to salvage a troubled season. While the Devils will quickly become the most boring team in the NHL under Lemaire (that’s a fact, folks), they may start to win a little. And Lou will be a hero again. Right now, at the Christmas break, Lou’s charges sit dead last in the Eastern Conference, a full 20 points behind the Boston Bruins for the eighth, and final, playoff spot. They have given up 48 more goals than they have scored. That scoring deficit will probably change fast too. Smart guy? Check. A winner? Check. A person you’d want your kids to be like? Not so much. Like the grinch dad on the kids hockey team, Lou doesn’t make Santa’s “nice” list. I guess “nice” and “business” continue to be exclusive for some people. Probably most people.